GreatStuff, located at the Talleyville Center on Silverside Road. The resale shop which opened in October 2010, offers a wide range of wonderful items, such as clothing, shoes, jewelry, and furniture. 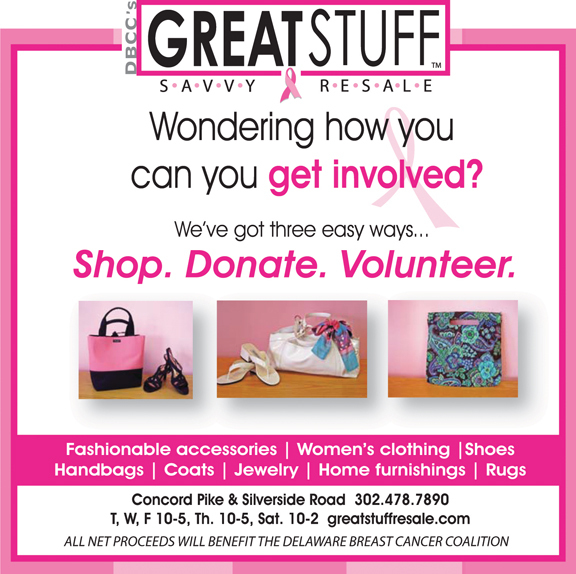 If you are interested in donating items and want to help a great cause at the same time, call Great Stuff at 478.7890 for details. Great Stuff is the place to purchase brand name, designer fashions and handbags at great low prices. If you have not visited our shop yet, you can not imagine what you have been missing! Want to get involved? Call shop manager, Dale Maahs at 478.7890 to discover all the exciting volunteer opportunities available at Great Stuff. Your involvement at any level, will benefit the Delaware Breast Cancer Coalition and help to support women and men in our local communities that have been affected by breast cancer. Call us or stop by today, we would love to meet you!